Use our Stuffed Chayote Recipe for an unforgettable family dish! 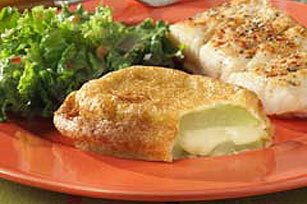 We bet you'll be asked to make this deliciously cheesy Stuffed Chayotes Recipe again! Bring 2 quarts salted water to boil in large saucepan. Add chayotes; cook 4 minutes or until crisp-tender. (Do not overcook.) Drain chayotes; pat dry. Cover each of 8 of the chayote slices with 1 cheese slice; sprinkle with desired amount of crushed red pepper. Top with remaining chayote slices. Set aside. Beat egg whites in small bowl with electric mixer on high speed until soft peaks form. Add 1 of the egg yolks and 2 tsp. of the flour; beat on low speed just until blended. Discard remaining 3 egg yolks or reserve for another use. Dip chayotes into remaining flour, turning to evenly coat both sides. Pat slices gently to remove excess flour, then dip into egg white mixture. Heat oil in large saucepan on medium-high heat. Carefully add chayotes, 1 at a time, to hot oil; cook 1 minute on each side or until golden brown on both sides. Drain on paper towels. Serve with a lean piece of meat and a mixed green salad. For best results, heat oil to 350°F. If oil starts to smoke, the temperature is too high. Use leftover egg yolks in your favorite custard.